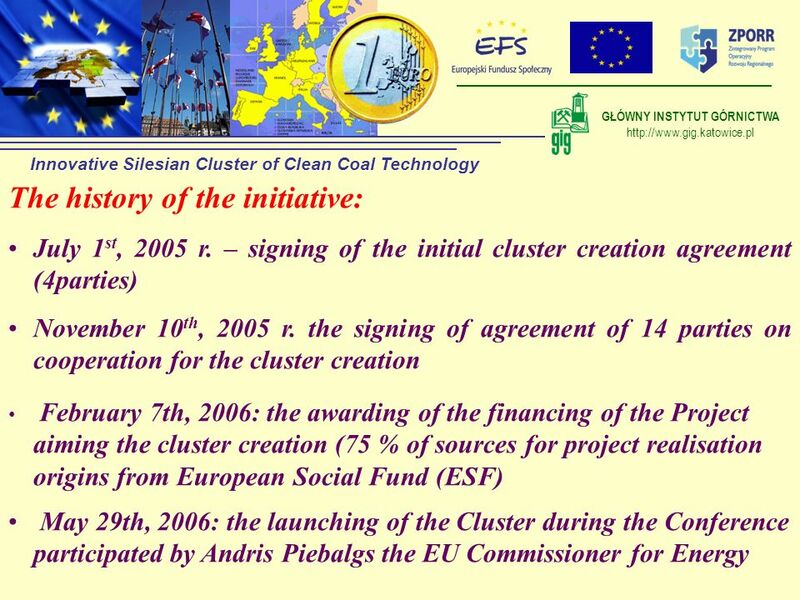 Innovative Silesian Cluster of Clean Coal Technology The history of the initiative: July 1st, 2005 r. – signing of the initial cluster creation agreement (4parties) November 10th, 2005 r. the signing of agreement of 14 parties on cooperation for the cluster creation February 7th, 2006: the awarding of the financing of the Project aiming the cluster creation (75 % of sources for project realisation origins from European Social Fund (ESF) May 29th, 2006: the launching of the Cluster during the Conference participated by Andris Piebalgs the EU Commissioner for Energy I would like to present new regional initiative: to create innovative cluster of clean coal technology. 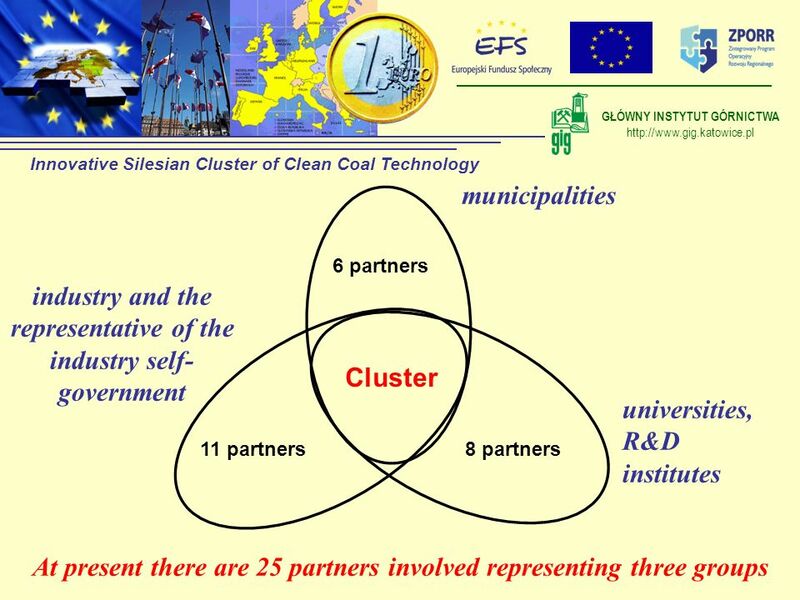 Innovative Silesian Cluster of Clean Coal Technology The formal aim: (Regional) Cluster creation to identify what predestines the Silesia Region from the point view of location of the cluster. What activities we are, and what activities we can be strong in? (the main challenge: changing of the image of Silesia Region) to encourage potential partners for cooperation, even they, in most cases, compete (the main challenge: increasing the trust among the partners) to identify the common product(s) to identify the value chain - competences to identify added value – profits for partners (the another challenge: forming the future cluster structure) I would like to present new regional initiative: to create innovative cluster of clean coal technology. Innovative Silesian Cluster of Clean Coal Technology The practical aim –to the answer where we are, where we can be strong in the scope of Clean Coal Technologies (CCT) by CCT we understand technologies design to enhance technical and economic effectiveness of coal production, coal preparation and coal utilisation (conversion of energy and coal processing) and to increase the acceptability of all mentioned processes from the point of view of environment impacts (the main actions and challenges: creation of the common R&D programme for the partners and its common realisation – financing from multi - sources facing up to the outer competitors) I would like to present new regional initiative: to create innovative cluster of clean coal technology. 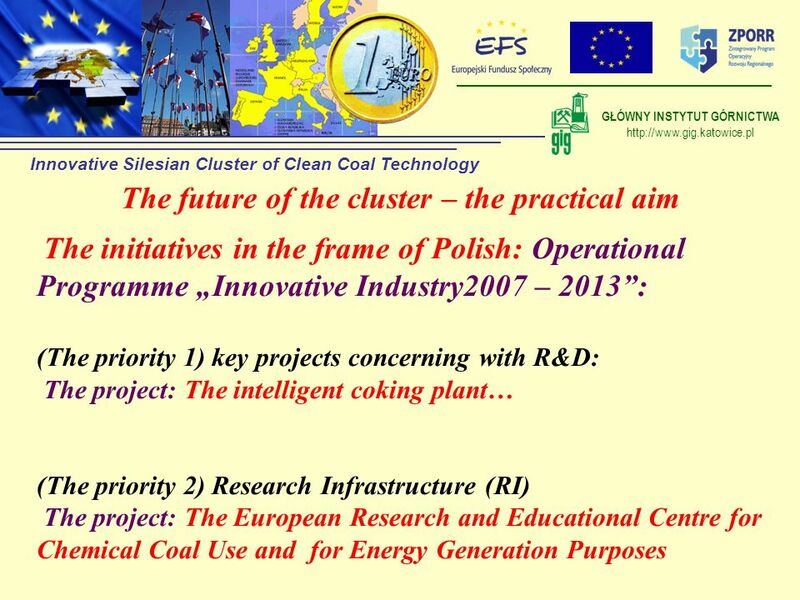 Innovative Silesian Cluster of Clean Coal Technology The future of the cluster – the practical aim The initiatives in the frame of Polish: Operational Programme „Innovative Industry2007 – 2013”: (The priority 1) key projects concerning with R&D: The project: The intelligent coking plant… (The priority 2) Research Infrastructure (RI) The project: The European Research and Educational Centre for Chemical Coal Use and for Energy Generation Purposes I would like to present new regional initiative: to create innovative cluster of clean coal technology. 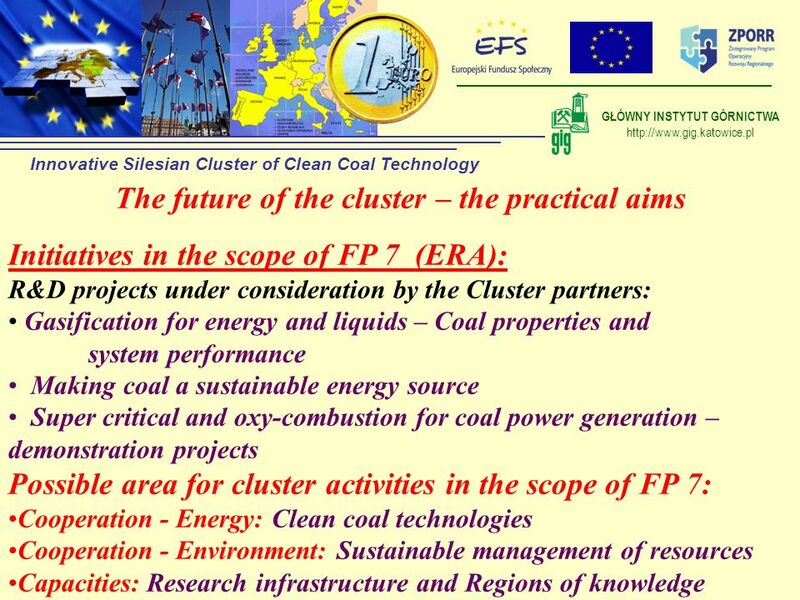 Innovative Silesian Cluster of Clean Coal Technology The future of the cluster – the practical aims Initiatives in the scope of FP 7 (ERA): R&D projects under consideration by the Cluster partners: Gasification for energy and liquids – Coal properties and system performance Making coal a sustainable energy source Super critical and oxy-combustion for coal power generation – demonstration projects Possible area for cluster activities in the scope of FP 7: Cooperation - Energy: Clean coal technologies Cooperation - Environment: Sustainable management of resources Capacities: Research infrastructure and Regions of knowledge I would like to present new regional initiative: to create innovative cluster of clean coal technology. 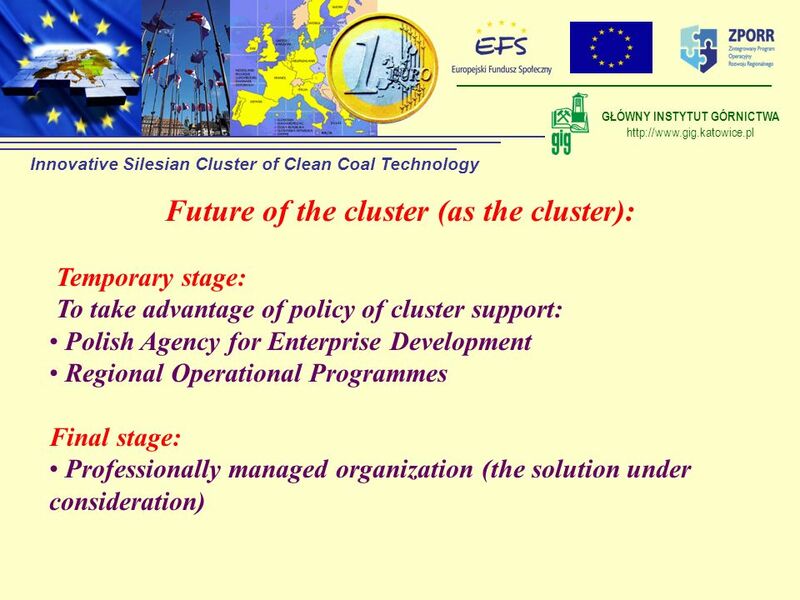 Innovative Silesian Cluster of Clean Coal Technology Future of the cluster (as the cluster): Temporary stage: To take advantage of policy of cluster support: Polish Agency for Enterprise Development Regional Operational Programmes Final stage: Professionally managed organization (the solution under consideration) I would like to present new regional initiative: to create innovative cluster of clean coal technology. 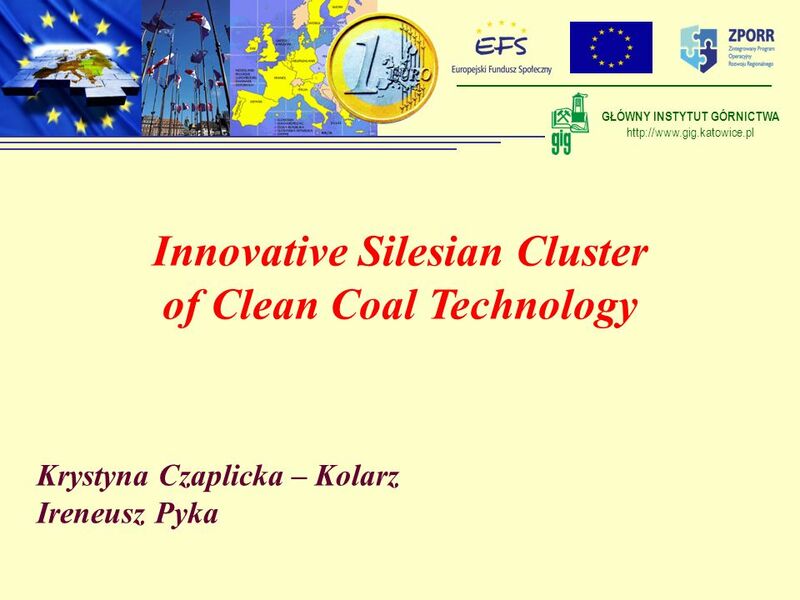 Innovative Silesian Cluster of Clean Coal Technology Dziękuję za uwagę Zapraszam na stronę: I would like to present new regional initiative: to create innovative cluster of clean coal technology. Download ppt "GŁÓWNY INSTYTUT GÓRNICTWA"
Overview of TransBonus project Overview of TransBonus project 1st Innovation Dialogue Forum : Towards a regional innovation system WBC-INCO.NET. OPEN DAYS 2006 Workshop 12E28 – 12. October The new European Social Fund DENMARK Head of division Preben Gregersen Ministry of Economic and Business. Community Strategic Guidelines DG AGRI, October 2005 Rural Development. EU funds for RTDI: how to fully exploit synergies among Structural Funds, FP7, and CIP Michelle Perello Consulta Europa 8th May 2009, Prague Research Connection. POLAND Development Management System in Poland Brussels, 2 July 2010. Regional Policy EUROPEAN COMMISSION Open Days EU Instruments for RTD and Innovation: the Structural Funds Christine Mason REGIO.C1 EUROPEAN COMMISSION. Community Strategic Guidelines DG AGRI, July 2005 Rural Development. SMME Development Strategy Review 02 June Economic Development Vision We envisage the Eastern Cape as a province where all her people share the. Cohesion and Regional Innovation CG: “Horizons 2015: First Experiences, Emerging Expectations” V.Kalm, San Servolo 31.10.2014.